Save the Date-August 17th from 3-7pm for the Community Carnival. 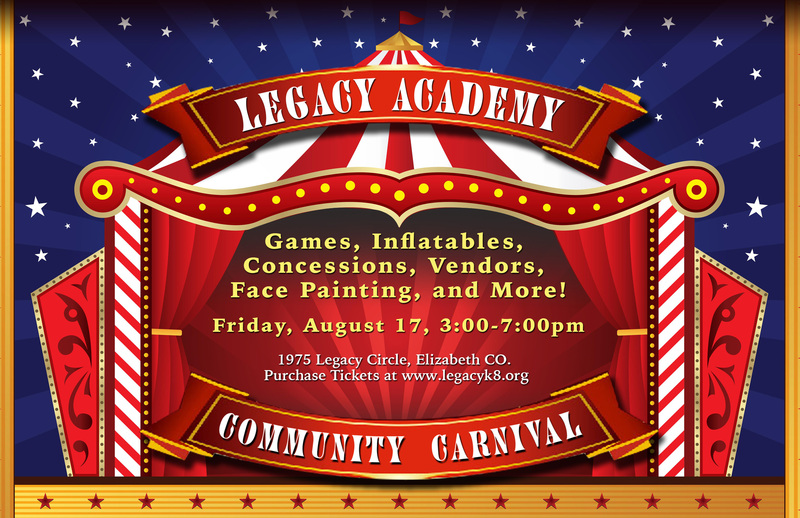 There will be games, inflatables, concessions, vendors, face painting and more! Tickets coming soon. It was great to see three solid candidates on the ballot for the board election this year! Thank you to each of the candidates for being willing to run for the open seats on Legacy’s board. Thank you as well to each of the parents and staff members who participated in the election. After tallying the ballots, it is our pleasure to announce that our new directors will be Michael Hendrickson and Matt Ledesma. Please offer your thanks to each of our candidates when you have an opportunity! We have three candidates running for two positions on the board. The election will be held on Friday, April 27th. Please click on their names below to read their Letter of Intent. These letters introduce themselves and they share their thoughts on education, how they interpret Legacy Academy’s mission statement and their commitment to Legacy Academy. Time and location: The election for two board members will be held on Friday, April 27th at Legacy from 7am to 7pm and Creekside Community Church from 8am to 3pm. Voting ballots will not be accepted after 7pm on April 27, 2018. • If a person is unable to vote at the school on April 27th, absentee ballots will be available at the Legacy office April 23– April 26th. These ballots must be returned to the school office no later than 7 pm on April 27th to be counted. If the election scheduled on April 27th has to be canceled for any reason, it will be held on the following Friday. The results of the election should be known the night of April 27th (unless there is a need for a run-off or a cancellation). A report will be made available to the candidates and current board members after the counting of the votes is concluded. An announcement to the entire school population concerning the results of the election will be made on the following morning. Congratulations to the following Legacy Academy students who were recognized at the STARS (Students Taking Accountability and Responsibility Seriously) banquet this last weekend. We are proud of you. We are at the end of another great school year at Legacy Academy! We are THANKFUL to have a great community of parents, student, administration, board representatives, faculty, and staff. Thank you for choosing Legacy Academy, we count it an honor and privilege to serve you. There will be a plant sale May 10th and 11th so please let your children know they can purchase plants and flowers at that time. There will be many to choose from. If you are interested in placing a pre-order, please contact Mollie Holm ASAP at mollie.holm@legacyk8.org. We need volunteers to help run the store please e-mail mollie.holm@legacyk8.org. Electrical Volunteer Job– We are looking for a certified electrician to do a small job for volunteer hours, please e-mail Anne if you can help anne.stanley@legacyk8.org. We are in need of someone who could fill in some erosion and around the stairs leading down to the fields. We also need someone who has the ability to build additional stairs to the fields at Wild Pointe. We are in need of someone with a sturdy trailer to pick-up guardrail post to place around the trail at Legacy Academy. We need some to place the guardrail post on the trail at Legacy Academy. We need someone with a skid steer or compact tractor to move and place gravel between guardrail post on the trail at Legacy Academy. We are in need of help installing a bollard (the round steel tubes filled with concrete) around the gas lines near the portable classroom. Please e-mail Ms. Anne if you can help with any of the above items at anne.stanley@legacyk8.org. We will donate lost and found on the afternoon of Thursday, May 24, 2018. Please stop by and take a moment to retrieve your child’s items. Please remember, always label all your student’s items and we will make our best attempt to return them. Our office is open in the summer on Tuesdays from 9:00 am to 1:00 pm with the exception of Tuesday, July 3, 2018. *Please remember Kindergarten has a shortened schedule on Kindergarten Play Day. Kindergarten Students do not return after this day. We accept payment online for student meals using a bank account, Visa or MasterCard at payforit.net. Eighth-Grade Graduation at 6:00 pm in the Gymnasium. *Coming next week….Dress in Avalanche Colors /Free Dress of Choice Wednesday, April 18, 2018.